He scored two touchdowns in his NFL debut in a pre-season game against the Dallas Cowboys, he has been complimented on his ball carrying skills by none other than the President of the United States of America just a year ago as a member of the LSU Tigers, and he is now just one spot behind the best running back in the entire NFL. Lawrence Vos, editor of NFLFANINENGLAND, talks exclusively to San Diego Chargers rookie running back sensation Jacob Hester, as he gears up for his first season in the California sunshine. The interview took place thanks to RJ Tioseco, from the Chargers PR staff, who asked the questions to Jacob Hester on Tuesday 12 August 2008, at the Chargers training facilities. Lawrence Vos (LV) — How excited were you when your name was called in the third round of the NFL draft by the San Diego Chargers, knowing that you would be lining up with and learning from the number one running back in the NFL? Jacob Hester (JH) — It’s a great feeling. Anytime you get drafted in the NFL no matter what round you’ve accomplished something a lot of people wish they could. The situation that I fell into with L.T. being gives me an opportunity to learn from the greatest. LV — You are listed as being able to play running back and fullback. With the departure of the legendary fullback Lorenzo Neal before you arrived many fans will be looking for someone to take over the role of Neal — is that you, or are you looking to establish yourself as the number two running back behind LT? JH — I’m trying to do a little bit of both. Lorenzo Neal is probably the best fullback ever and L.T. is probably the best running back ever. I try to be a little bit of a fullback and me and Darren (Sproles) will spell L.T. whenever he needs a rest. Hopefully I can contribute to both ends. LV — What are the biggest differences that you are experiencing as an NFL rookie compared with being an LSU Tiger? JH — The biggest difference is starting over again. You are not the top dog anymore. Trying to earn people’s respect and some playing time. Starting over, that probably the biggest difference. LV — Will there be mixed emotions for you when you come to London in October as you are a Louisiana native and a former LSU Tiger as you will now face the New Orleans Saints at Wembley Stadium? And were you a Saints fan growing up? JH — My team was obviously the Saints being from Louisiana. It’s was our only Pro Sports team at the time before the Hornets got there. I was a big Bobby Hebert fan. It’s gonna be fun playing the Saints because obviously they were my favorite team and now obviously the Chargers are my favorite team, so it’s going to be fun. LV — Which player did you most admire as a child and then as a teenager? And which NFL players do you admire who are currently playing? JH — Growing up I was always a Dan Marino fan. I loved watching him. I wore number #13 because of him. A player now is L.T. because I get to learn from the best running back ever be in meetings with him on a daily basis. LV — You have been described by many draft evaluation reports as an excellent short yardage back — how would YOU describe your own running style? and what skills do you think helped the Chargers to draft you in the 3rd round? JH — Short yardage is a mind set. A lot of people try to get the home run on every play. If you are a short yardage back you get four yards then you to take it. You might be able to bounce outside and get the long run but if you get four yards every run that will help your offense more than losing yards and having one big run. LV — How were you and your family affected by Hurricane Katrina and did you play a part in the recovery operation following the devastation caused? JH — My family is in North Louisiana so they didn’t get affected too much. My school obviously got affected because we are so close to New Orleans. My dorm had three or four sets of families crammed into our little dorm rooms because they didn’t have a house. Our football team came together and tried to do what we could to get things back to normal but it was and still is a touching time for Louisiana. LV — Are you looking forward to coming to London, England if it is for the first time and what are you looking forward to seeing or doing whilst you are here ? If you have been to England before please can you describe your experience? JH — I’ve never been overseas. I’m looking forward to it alt because I’m a huge soccer fan. If we have some free time me and the guys will try to catch a soccer match. We don’t care what teams it is we just want to watch a good soccer match. LV — Having watched the likes of LaDanian Tomlinson, Chris Chambers and Antonio Gates on television just like myself for a number of years what is it like waking up every morning knowing that you are now team-mates? JH — It’s a good feeling. When you first get here you get a little star stuck seeing those guys you watch for years but once you’re in it you realise they are normal guys just like you that want to play football. You just try to learn as much as you can from guys like that. LV — What are some of the best bits of advice both on and off the field that coaches and veteran players have given you in your first few months as an NFL athlete and a San Diego Charger player? JH — Best advice is that your rookie year is a marathon its not a sprint. Conserve your energy and try not do things that may not b good for you now. You just have to let your body know that its going to be a long and let your body prepare for that. 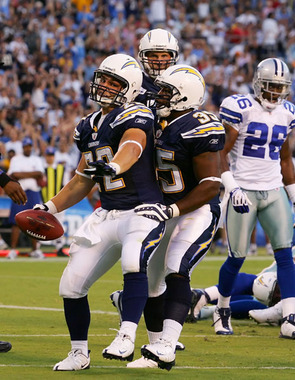 LV — Can you describe the emotions the first time you put on a Chargers uniform and placed the famous Charger bolt of lightning helmet on your head? JH — It was a good because in college we wore the same jersey every week. White jersey, yellow pants so it was good to change it up. The thing about putting on the jersey is the NFL logo. Not only the Charger logo but the NFL logo because it lets you know that you’ve made it to the biggest stage there is in the sport that you love. LV — What are your goals for your first season in the NFL, both team wise and personally? JH — As far as personal goals, I don’t like to set personal goals. As long as I got out there and try to help the team as best I can. I don’t look to have these certain stats. I just want to help the team win some games and obviously the ultimate goal for every team is to make it to the Super Bowl. I just want to do the little things and hopefully we’ll get to where we want to be in the end. LV — What is it like facing the likes of Jamal Williams and Shawne Merriman at practice every day? Who has laid the biggest hit on you so far? JH — We don’t hit too much in practice so I haven’t had too much contact. Our defense is the best in the league in my opinion so it is great practice for me and the other running backs to experience. LV — Tell me about a certain famous relative of yours – Mr Terry Bradshaw, a four time Superbowl winner — Has he followed your complete football career and what advice has he given you? JH — He’s a pretty hard guy to keep in touch with but I did get a chance to see him when he called our games at LSU. He gave me some good advice. What you see is what you get with him and he just told me to get out there and have fun playing football. 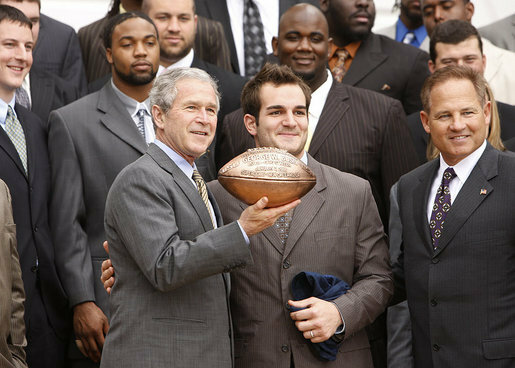 LV — You met President Bush in 2007 — what words were exchanged? JH — I got to hand him a football our team presented him. He told me he like the way I ran the football. It’s kind of funny hearing the President say that to you. LV — I understand you are good friends with former high-school team-mate John David Booty who was selected by the Minnesota Vikings in the 2008 draft – what conversations have you had about both now being in the NFL? What chance do you think Booty has of becoming the Vikings starter this year or next? JH — It’s been fun comparing what they do in their camp versus what we do in our camp, kind of exchanging stories. He’s got a great opportunity there in Minnesota. They got a young guy over there in QB but if he falters I think JDB can step in and be the starter. He’s poised and played at USC, a pro offense, so I think it will be easy for him. LV — What do you think about the fact you will now play against Brett Favre when the New York Jets travel to Qualcomm Stadium ( for Monday Night Football in Week 3) ? JH — That’s a great opportunity. Everybody loves watching Brett Favre and the way he plays football. The fact that it’s on Monday night makes it that much sweeter. We are definitely looking forward to that game. LV — Thank-you very much Mr Hester and the best of luck in the 2008 NFL season. Can I personally thank both Scott Yoffe and RJ Tioseco from the San Diego Chargers public relations staff for organising and supporting me with this interview, without their help this would not have been possible. Please feel free to add any comments on this interview … What would YOU have asked an NFL rookie ? You keep on referring to ENGLAND. Why cut out the rest of the UK. We are represented by this game too you know. Your entire blog repeats this. It is not wonder that Americans think that the UK is England, all you do is perpetuate this. Hang your head in shame. I refer to England because I LIVE IN ENGLAND – I DO NOT LIVE IN SCOTLAND, WALES, OR NORTHERN IRELAND – so I have NO SHAME. I am ENGLISH and have lived in ENGLAND all my life. Deal with it. note the blog name – NFL FAN IN ENGLAND – you are truly an idiot. Get your own blog whereevey you are from and do your own bloo*y interviews you fool. Yeah, Most Americans know the UK is the United Kingdom. Not sure where you got that from. Go Chargers!! Why did you put a * instead of a ‘d’ in bloody. Is that some kind of English thing?